On Thursday or Friday (not sure which) my brother-in-law, Christophe, took us to a cave. No, that is not cave, but /cav/. Yes, short a. Anyway. 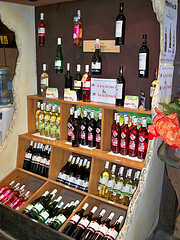 A cave is a place where grapes are processed into wine. 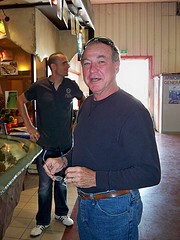 Christophe is in the Languedoc region of France. He is part of a different co-op than the one he took us to. This cave was the largest in the region. 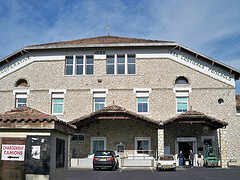 It is the Pomeroles Cave. Here is a photo. 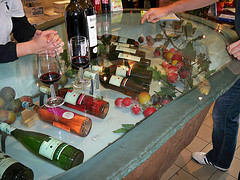 We were able to taste several wines (before noon). They were really good. 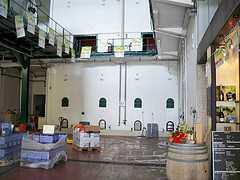 The tasting is inside the warehouse where the wine is fermented and stored. It was so cool. There was the coolest thing, too. 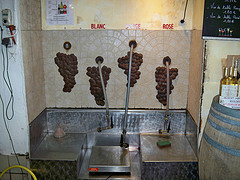 There were spigots where you could bring a jug and fill it with one of three types of wine. this wine is what the older locals drink. 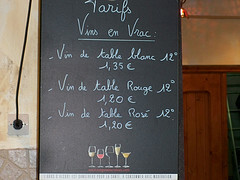 It is not aged, but Christophe says it is perfectly good table wine and it is cheaper than gas! That’s right, a liter for a 1.2 euro or so. Here’s a picture of that. Here are a group of photos from the inner workings of the cave. 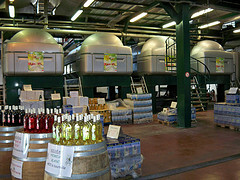 You can see some of the fermenting and purifying tanks. I don’t know what every thing is because Christophe’s English is marginally better than my French. Let me promise, we were both at a disadvantage, but somehow managed to get along. Notice my dad…he had already sampled a few wines. They were NOT skimpy with the samples, either. It was so funny…I was every intimidated by the idea of going to a real French wine producer and tasting the wine, but the people there just acted like it was another day on the job and so did Christophe. Super.fun. On the way back from the cave, Christophe took us to see his vineyard. All I can say about that is WOW! He has a lot of land and a lot of grapes. He grows two varieties. One is picpoul. The other is a red. 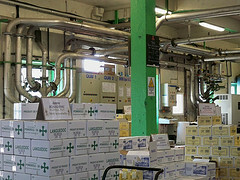 The picpoul is a grape that is protected. http://en.wikipedia.org/wiki/Piquepoul Only the growers in his region can grow it. In addition to all fo the grape vines, there are almond trees. Christophe pulled and cracked fresh almonds for us. He also showed us wild rosemary and thyme…not to mention many other herbs that I did not recognize and could not get the jest of through translation. There are also tons of markers on his land. The markers tell the story of the area using cartoon Roman soldiers who appear to be less than smart. 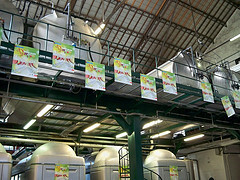 Here si a gallery of the vineyard and the signs. I also tried to get a couple fo horizon shots. Remember, they are 25 miles from the Sea and about the same from the mountains. They really have it all in this area. Tomorrow I will continue my France posts with pics from the coast.